1 According to Jewish tradition, in the ancient city of Ur, a boy named Abraham boldly hit clay statues with a hammer. They shattered. Bits of clay flew about the room. His father had made the clay idols, but Abraham didn't like them. He believed in one God. Abraham broke the statues when his father left him in charge of his store. He destroyed all the idols...except one. 2 Abraham did something mischievous next. He placed the hammer in the surviving idol's hands! Abraham's father was probably furious when he discovered what his son had done. Abraham blamed the last idol on the rampage, and his father said, "These idols can't do anything on their own, so you must have broken them!" Abraham then had a good argument for his belief in one God since his father had finally admitted that the idols were useless. He survived his father's wrath and became one of the patriarchs, or founders, of Judaism. 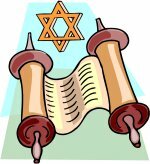 3 Judaism is an old religion and is based on the belief in one God. It is at the heart of both Christianity and Islam. It began with Abraham about 3,500 years ago. Abraham lived in what is now Iraq. When he grew up, he tended flocks of sheep and wandered around the desert looking for water and pastures. Jews believe that God spoke to Abraham and made a covenant, or bargain, with him. Jews believe that God made them his chosen people. 4 Abraham's people were called Hebrews, and later, Israelites. Being Jewish can mean different things to different people. For some, it means being born into a Jewish family and growing up with Jewish culture. For others, it also means following a way of life based on the values of the Torah. These laws apply to all parts of life, even food. The food that strict Jews eat is called kosher, which means fit. Feedback on What Is Judaism?